Categories: Bengal Connect, Sculptures / Installations. 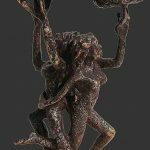 Tags: Bronze Sculpture, Hindu Goddess Vaishnavi, Mythology, seema kohli, seema kohli sculpture. Seema Kohli’s works reveal a claiming of feminine subjectivities, an altered concept of feminine sexuality. Her art practice involves various disciplines from drawing, painting, sculptures, installations and performance. The most significant one to emerge out of liner forms and paintings is ‘Performance Art’. Decay, hybridization & transformation: Creating new identity; reshaping belongings; intimacy; a dialogue of matter and memory ,myth all constituting a visual language of her work. Style : Her works bring into focus a woman’s physical attributes, her intellect, thought, dreams and realities. There is a celebration of beauty, sensuality and intimacy in her art. Seema’s most recent thematic engagement has been that of the ‘Hiranyagarbha’, that evolved from a mantra of the Yajur Veda, reflecting the quiet and subtle beauty of constant procreation. All the works are a prayer to the eternal self – a way of meditation. These works are spiritual but not religious, exploring with them, a poetically elegant and richly sensuous female form. The ‘Golden Womb’ is a celebration through which the supremacy of a female is established and how she procreates and keeps the journey of life, forever on. Her work is symbolic of the progress and recycling of thought processes in the human mind, which is portrayed as calmer, more mature and serene both in terms of the palette and the form. All her works are a gesture of the divine, a prayer to the eternal self, a way of meditation. “Time” as a factor, is central to her practice, whether it’s a wrapped object or a performance. She uses time as medium, which is extended, assembled and captured in all her media, be it painting, sculptures or installations. The aspects of continuity, repetition, vulnerability, duration, temporality, awareness, situation and public involvement are also inherent qualities that inform her art practice. The process before and after the performance is important and challenging. Born : 1960 in New Delhi. 1981 : B.A (Hon.) Philosophy, Miranda House, Delhi University, New Delhi. Shows & Exhibitions : Since last 30 years of practice Seema Kohli has had over 20 solo show in Venice, Brussels, NY, Dubai, Singapore Delhi, Mumbai, Hyderabad, Bangalore. Has participated in International Bienniale’s (Venice, Shanghai, India), Art fairs (Hong Kong, Basel, Beijing, Madrid, India) Her work can be seen as public art as murals of 10’ x 100’ at the Delhi International Airport, Mumbai International/Domestic Airport, the Defense Ministry, Tata Residency, Manipal University, ONGC, Tata Center of Excellence and many more. She has had interactive session and experiential performances at Venice Biennale 2015, TedEx Chennai 2013, WIN Conference Rome 2012, Prague 2013; NGMA Bangalore 2010, 2012 etc. 2008 : Lalit Kala Akademi Award for Women Achievers in Contemporary Indian Art, New Delhi.